The other night, for what is probably the second time ever, I was upstairs working on wedding stuff in the teeny tiny little room that we've designated as an office. You've never seen it on the blog, because it's not picture worthy in the least. Nevertheless, it felt really good to be sitting at a desk rather than crunched up in an armchair with the laptop in my lap, which has a tendency to make my thighs really hot. That sounds...weird. But you know what I mean. Our office is really Mike's office - full of his papers and electronics and stuff that I've banished from other areas of the house. But working up there made me realize how much I would really really love to have an office space of my own. Somewhere I could keep all of my documents (and lets face it, all household documents), craft stuff, and safe keep all of my antique hardware that I seem to hoard for "some day". Or not even someday. I just love it and don't care if it ever gets used. 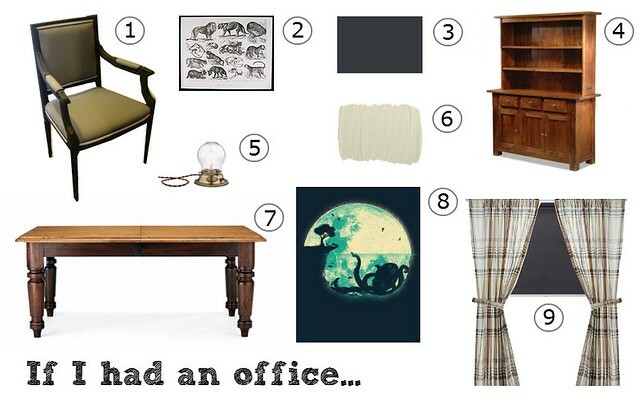 So this is me dreaming of an office space that I may or may not ever have. 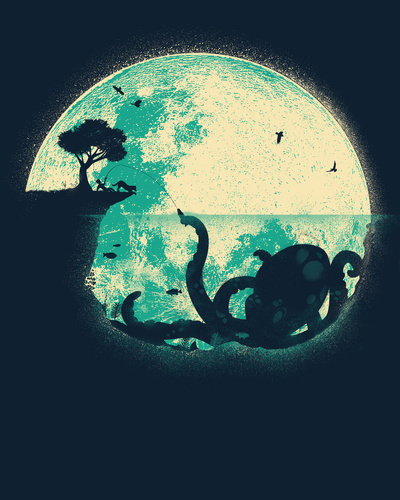 I discovered Society 6 thanks to Sara of House Bella, and I came across this print that I am head over heels in love with. It's not very often that art "gets me", but this one does. I don't really know how to make a mood board but here's my attempt at one anyway with the octopus/ocean/moon print included. 1) I'd love to use one of the chairs that I rescued and rehabbed from an auction in an office. I'd throw on some antique casters to be able to move around in it a bit (like these ones that I bought for an ottoman redo gone bad). I'm still not great with the camera, so you'll just have to take my word for it that the yellowish tinge on the chair isn't there in person. 2) I bought 8 antique zoological prints off of eBay a few months back - Mike isn't crazy about them so having a room that I'd have free rein over would be amazing. 3) This is Farrow & Ball's "Railings". I've been pining over wood (heh - pun) floors and baseboards painted in a dark charcoal colour. 4) Storage is a must in pretty much every room in the house. Instead of just a plain bookcase, I think a wood hutch would be a great option because of the concealed bottom storage. This one is from Town Art Export. If I were actually putting this room together I'd look for an antique version. 5) This quirky lamp is by Rejuvenation. At 125 bones it's one of their more "affordable" options. Please note that that is sarcasm. Regardless, I think that lamp is pretty wicked. 6) I think it's impossible for me to plan to decorate any room without including some reference to Sarah Richardson. This is "Seagrass SR34" from her line of paint colours, and I'd coat all four walls with it (although not without trying out a sample pot first since I can't really trust how it's showing up on my monitor UPDATE - Now that I'm seeing it on a different monitor, I think I'd go for something lighter). 8) There's that print again! I think I'd get it in the biggest size possible. 9) This theoretical window treatment is a combination of Ikea's ENJE roller blind in dark grey and their BENZY curtains. I think the curtains might be a little too brown, but they're good for inspirations sake. I realize a room like this wouldn't be everybody's favourite piece of cake, but that's just fine. And I now have a new appreciation for those who can make mood boards. My haphazard example took me hours, and I'm not even exaggerating like I tend to do every single day of my life. So who out there has an office all to their lonesome? Or do you share with a partner? Or do you not have one at all?